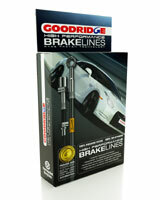 Goodridge brake line kits are manufactured, constructed and tested entirely in the UK. This gives you peace of mind that each component used is of the very best quality available. K300 are stockists and distributors of the complete range of high-performance Goodridge brake lines and products. Goodridge stainless steel braided brake lines have become the standard in professional motorsports where the ultimate in braking is required. There is no room for volumetric expansion, or "mushy brakes" caused by rubber brake lines. A highly efficient braking system allows you to get deeper into the corner and onto the accelerator faster. Additionally, when G-Stop/Brakeline Kits brake hoses are used with an ABS braking system they virtually eliminate brake pedal "chatter" and significantly reduce stopping distance. 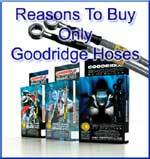 Goodridge brake lines are available to fit almost every make or model of vehicle and motorcycle. Do you want to build your own brake or clutch lines, then our Buildaline range could be for you. Simply buy the components you need which you can find on the Buildaline page. The hoses are bought as precut lengths with adapters already fitted. This means that you just choose which fittings are needed and fit them together. How would you like some Gold coloured hoses with Black fittings? Now available we have Black Gold and also the amazing Black Glow hoses. Originally formed by Stuart Goodridge in 1969, Goodridge rapidly established a core business of importing aircraft steel braided hose for the UK motorsport market. The continued success and expansion in this market allowed the company to develop its own manufacturing base. Through continued product development, Goodridge were able to form a network of Global subsidiaries, initially in France followed closely by Japan, Benelux, Spain, Germany and three locations in the United States. Over the last 15 years the group has developed its original equipment manufacturing capabilities in specialist areas of large-scale automotive product, with a client base which includes the most prestigious marques. Built on a solid foundation of core activities, Goodridge provides solutions to technical problems, with rapid response production capabilities and quality standards to meet any clients demands. Every single brake hose in every single kit is pressure tested before it leaves the factory. This level of testing is unique to Goodridge. Some of the features of these high performance hoses include small internal diameter, special hose design for flexibility, special hose design for extra strength, stainless steel braiding which helps to dissipate any heat better than the standard rubber. All these features go to give between 10 to 25% more braking efficiency. Goodridge brake lines, originally developed for Motor Racing, feature stainless steel braided hose, which doesn't expand like rubber. The result? Better, more responsive braking and reduced stopping distances. As used by leading WRC and F1 teams, Carl Fogarty's Superbike team, and Steve Peat, 2002 world downhill mountain bike champion. Kits available for every make and model of car, motorcycle or mountain bike, so whatever you ride, we can stop you more quickly. Goodridge - the World's leading manufacturer of high performance fluid transfer systems, driving the top racecars, performance road cars and motorcycles across the globe. K300 stock an extensive range of Goodridge adapters in a range of thread types, and a complementary range of coolers, firesleeves and quick disconnect couplings. Goodridge products cover all fluid transfer needs including hydraulic clutch and brake lines, and lightweight hoses for fuel, oil cooler, gearbox and water systems.